An aggressive turnaround plan has CSX on the fast track. Shares of CSX (NASDAQ:CSX) rose by 12.9% in 2018, according to data provided by S&P Global Market Intelligence, easily outpacing the S&P 500's 6.24% decline. 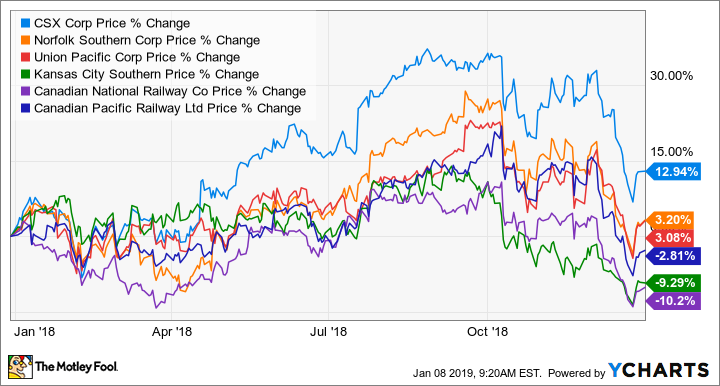 CSX was the standout among major North American railroads for the year as well, with its stock performance easily outpacing the 3% to -10% returns generated by its publicly traded rivals. CSX in 2017 was the target of an activist-led coup that installed longtime Canadian Pacific Railway Limited management to replicate a turnaround strategy that transformed CP into one of the continent's most efficient railroads. The railroad initially was plagued by delays as it implemented its "precision scheduled railroading" (PSR) techniques designed to get more out of existing equipment, but produced eye-popping results in the second half of 2018. The company in the third quarter of 2018 posted earnings per share of $1.05, more than double what it generated in the same quarter a year prior and easily beating consensus estimates. Its efficiency rating, a measure of costs as a percentage of sales, dropped below the key 60% threshold to 58.7% in the quarter thanks in part to a 2% decrease in operating expenses. As importantly, volume in the quarter grew by 4%, a stat that went a long way toward alleviating market concerns that earlier delays had cost CSX business. I'll confess CSX has done a much better job than I predicted navigating its transformation, and shareholders who believed in the company and its management have been rewarded. Still, I don't have any desire to jump in at these levels. CSX appears fairly valued. The company today trades at 8.419 times trailing earnings, in the middle of the U.S. railroad range of 9.7x to 7.2x. Given East Coast-focused railroads face more congestion and shorter stage lengths, which saps efficiency, and the work by other railroads to implement PSR techniques, I see no reason for CSX to trade at a premium. This is no time to climb on board CSX.